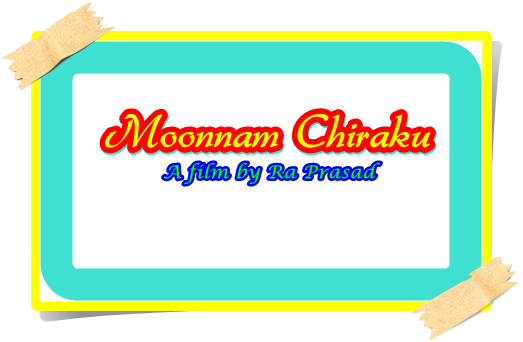 Moonnam Chiraku malayalam movie directed by debutante Ra Prasad will have Ra Prasad, Madhu Master, C R Rajan, Sheril and B Santhosh in prominent roles. For the lyrics of V R Santhosh, the tunes are set by Shabari. 'Moonnam Chiraku' is produced by Sirajudhin, Raju Pallikkara and B Santhosh under the banner Night Riders. The movie is based on the short story 'Kunju' written by Padmarajan. Blessy's 'Thanmathra' which was based on the short story 'Orma' written by Padmarajan was well received in the box office. Yet another movie is getting shaped which is on the story penned by the great filmmaker. Titled 'Moonam Chiraku' directed by debutante Ra Prasad is following the lines of the short story 'Kunju' written by Padmarajan. 'Moonam Chiraku' tells the tale of a couple who lives in the forest. As soon as a child is born, due to some circumstances it dies. Thus 8 children of the couple die without getting a chance to survive. Fortunately, their 9th child stays alive. This young kid is foreseen as a gifted kid and molded to find the treasure under the earth. Rest of the story takes the movie to the next phase with interesting incidents which happen to follow later. 'Moonam Chiraku' is being shot exclusively at the forest areas including Idukki, Edamalakudi, Valia Thoni. The movie also has Adivasis as actor while their music is also widely used in it. It would be a rare opportunity for the moviegoers to enjoy the songs and tunes solely owned by the forest dwellers. The scenic beauty of the forest will be captured using the advanced technology to give an everlasting visual experience to the movie lovers. Ra Prasad will don the central character with Madhu Master, C R Rajan, Sheril and B Santhosh will be seen in other prominent roles. For the lyrics of V R Santhosh, the tunes are set by Shabari. 'Moonnam Chiraku' is produced by Sirajudhin, Raju Pallikkara and B Santhosh under the banner Night Riders. It would be an opportunity for the new faces to show their talent on the silver screen. As the movie carries an interesting theme, it would be acceptable for the spectators. Produced with a limited budget, 'Moonam Chiraku' will be creamed with all essence to keep the viewers intact.